Meringues with Champagne Poached Strawberries to celebrate with a special little something to enjoy with a glass of champagne. Preheat the oven 100 celsius (220 Fahrenheit) and line a large sheet tray with baking paper or a non stick baking matt. To make the Italian Meringue combine the sugar and water in a small saucepan and stir to dissolve the sugar. If any sugar crystals stick to the side of the saucepan take a wet pastry brush and brush the sugar crystals down into the sugar and water mixture. Place over a medium high heat and bring the sugar mixture to a boil. Add a candy thermometer and cook until it reaches soft ball stage 115 Celsius (240 Fahrenheit). Remove from the heat. While the sugar mixture is heating place the egg whites in the bowl of an electric mixer along with a pinch of salt. When the sugar is almost at temperature begin whisking the egg whites (KitchenAid speed 6/10). Remove the sugar syrup from the heat and when soft peaks form in the egg whites switch the mixer to low and slowly pour in the sugar syrup in a thin steady stream, ensuring the syrup doesn’t hit the whisk and splatter everywhere and risking burning yourself. Switch the mixer to medium high (KitchenAid speed 6/10) and whisk until the mixture begins to cool and is thick and glossy and the mixing bowl is cool to touch. Around 10 minutes. Fill a piping bag fitted with a round nozzle and pipe a circle of approximately 10cm in diameter on the baking tray for the nest base. Pipe around the outer edge of the base for form the wall of the nests. Repeat with the remaining mixture to make 6 nests. You may have a little mixture left over. Either pipe additional nests or small meringues cookies which you can use to top the nests when serving. Place in the oven and bake for 50 minutes before switching the oven off. Leave the meringues inside the oven to cool completely before removing. For the champagne poached strawberries place the champagne and caster sugar in a saucepan and stir to dissolve the sugar. Split the vanilla bean and remove the seeds and add the bean and the seeds to the poaching liquid. Bring the liquid to a boil over a medium high heat and reduce the heat to low and simmer until reduced by half. Meanwhile place the strawberries in a bowl large enough to accommodate the strawberries and poaching liquid. When the champagne has reduced pour over the strawberries and cover with plastic wrap and refrigerate until ready to serve. Place the whipping cream and sugar in a bowl. Use a sharp knife to split the vanilla bean and scrape out the seeds using the back of the knife. Add the vanilla seeds to the cream and sugar and whip until soft peaks form. 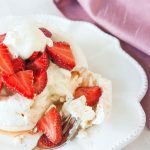 To serve add a dollop of cream to the base of each meringue and top with the strawberries and some of the poaching liquid before topping with a little extra cream. The unfilled meringues can be stored in an airtight container for up to 3 weeks.